Enjoy watching squirrels create a nest in the Esschert Design Squirrel House. Adding a squirrel house to your backyard will certainly bring a lively and unexpected element to it. This wooden roost provides squirrels a generous nesting site or hiding place, particularly for the winter months or birthing season. Three 2.25" diameter entry holes allow squirrels easy access to the unit, and the hole on the base provides them a secure and quick exit. One side of this home latches closed, and lifts upward for nest checks or cleaning. 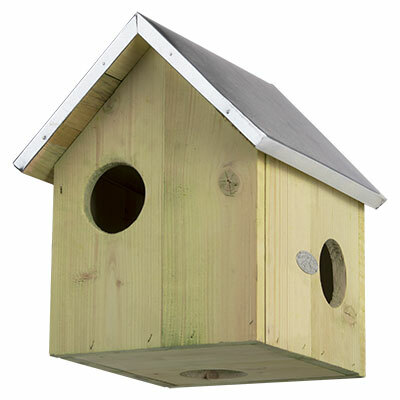 The 0.5" thick, wooden construction ensures the unit remains insulated, aided by its pitched roof. Silver colored metal covers this roof for dimension, and contrasts the green hue of the shelter. A keyhole opening at the back of the item enables you to attach it to a tree or post easily. Add an amusing home to your backyard with this Squirrel House.